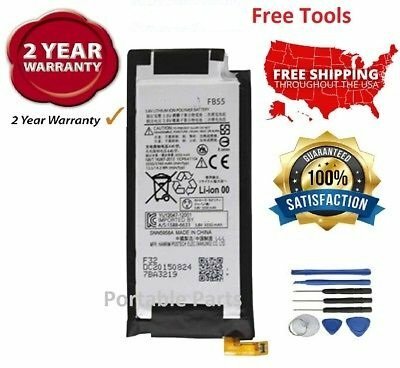 Samsal Battery FB55 for Motorola XT1585 Droid Turbo 2 XT1581 SNN5958A Moto X Force Condition: 100% New Model: FB55 Voltage: 3.8V Capacity: 13.5/14.3 Wh , 3550/3760 mAh (min/typ) Fit for : Motorola Moto X Force (XT1581 / Bounce) Motorola Droid Turbo 2 XT1585 XT1581 Package: 1x Battery & Free tools . Note: FREE SHIPPING!! Buy with confidence, 100% Satisfaction Guaranteed! We will not be responsible for any damage caused during installation If you are not satisfied do not leave negative feedback in retaliation for a defective product or something you were not expecting. Please just contact us through messages and we will quickly resolve the matter. We are strive to provide best customer service possible. If there is any problem, contact us and we'll try to get it resolved asap!! We ship within 24 hours of payment received with Tracking Number except weekend and holidays. If you have any questions about this product by Samsal-Parts, contact us by completing and submitting the form below. If you are looking for a specif part number, please include it with your message.